Childhood obesity remains one of the country’s greatest public health threats and nutrition experts say fathers can have a significant impact on the fat, sugar, sodium and calories their kids ingest while at school by packing them a healthy school lunch. A school lunch should include a main dish, side dish, treat and drink. The key is to pack as much nutrition into the meal as possible, in order to give your child the energy to learn and power through the day. Fathers also need to make sure their kids will actually eat what they’re given. 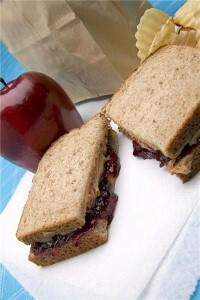 A sandwich is a great, portable main dish lunch option. Fathers can increase its nutritional value by using whole grain bread and filling it with lean protein, like tuna, turkey, certain cheeses or peanut butter. Leftovers from dinner are also great lunch options, as many schools have microwave ovens kids can use. Healthy side dishes and treats may include low-fat yogurt, fruit, veggies with dip, popcorn, pretzels or rice cakes. Increase the protein, if possible, by including a small cup of peanut butter to dip apples in or some hummus for veggies. When it comes to picking a drink, experts recommend staying away from beverages high in sugar and opt instead for low-fat milk or water. Flavored waters or 100 percent juice drinks are also good options for picky kids.